This just might be my favorite bento ever! F&B love Phineas and Ferb, and if I'm being completely honest here, so do Shaun and I. I'm especially a fan of Perry the Platypus, when he's Perry. Both kids even sleep with plush Perries! I keep looking at the show and thinking, Phineas is really a triangle and Ferb is a rectangle, I can make that. So I did!!! Ben has a cream cheese and jelly sandwich on Nature's Own Multigrain Rounds, topped with a cheese Phineas and Ferb. Their faces are made with a white swiss, eyes are boiled egg white topped with cucumber bits for pupils. Ferb's hair is cucumber peel too and Phineas' hair is carrot. We're packed in an EasyLunchbox today, I wanted a nice big area to work with the sandwich! ahaha!! that looks just like them! Awesome!! 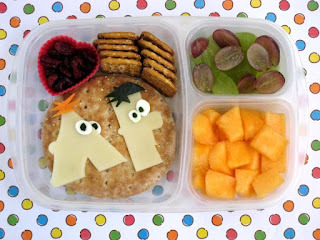 OMg we love P&F too.....I can not show my daughter this bento as she will demand one and there is no way i can recreate. Awesome job! That is awesome!! My hubbby LOVE Phineas and Ferb and I'd actually thought about making him a P&F themed lunch but just hadn't gotten around to it! Love yours! So.... looks like I'll be copying you! Good job! LOL your "Where's Perry?" question makes me laugh cause Perry is my boyfriends name so I think "He's at work..." My cousin who has a small child calls him Perry the Platypus all the time. I think this is one of the best ones you've made yet! Love it! Kids watch Phineas and Ferb too. Gonna show it to them ... So cute! That is totally adorable! My kids would love this!!! This is so awesome--my whole family likes Phinneas and Ferb! Very neat. Seeing the characters for their basic shapes makes it less daunting. This is great my son would love this. Oh! Oh, oh! I love it!! Now let's see you do Perry the Platypus! Love it! I'm sure once my oldest discovers Phineas and Ferb, I'm going to be making a lot of these!